I have to admit I was not having the best of weeks but being part of the BUDI Orchestra’s penultimate rehearsal yesterday was, as one of the participants said to me at the end the session, ‘better than therapy’. Some of the highlights for me of this week’s session were a couple celebrating their 59th wedding anniversary by bringing chocolates and biscuits to share with their orchestra friends and telling me this session was the ideal way to celebrate this pretty remarkable period of marriage; another couple who had told me they have been having difficulties communicating reaching out simultaneously for one another’s hands when Moon River was playing; and having people with dementia and their carers tell me that attending this group is the highlight of their week, indeed that they need no persuasion to get out of bed knowing they have their music group to come along to; and to hear that they consider the members of the group their friends. 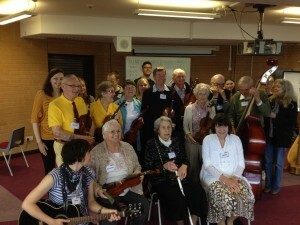 This all demonstrates the true achievement of the BSO musicians, BU students and my team members in rising to the deceptively simple challenge I set for this project: to create an atmosphere that was welcoming, fun, promoted equality between everyone, and where having dementia was not to be the guiding factor, rather for everyone to be part of a ‘normal’ group where people would learn and work together. And they have achieved this in spades! Seeing for myself the progress and development in those with dementia who have participated over a 9 week period makes this project worthwhile. For example a man, who on week one who was having trouble remembering how to play his double bass (even though he didn’t need much encouragement to teach me some basic notes), now jamming with the professional musicians; how another man, who brought his mouth organ to the first session and began to recall how to play, now plays all the pieces by ear and is smiling from ear to ear after the session ends. Seeing the relaxation and concentration on participants’ faces who had been anxious about first week, but who are completely in the moment and whose verbal communication skills have, to me, taken an absolute upturn, and who now chat easily and at length during the break and at the session end. For example, one participant invited me to their previous home if I was ever passing, it doesn’t matter that they live in Dorset now and were talking about their old address, the important thing is they have increased their sense of social confidence and are reaching out and connecting with others, something that is, all too often, sadly lost by others failing to accommodate the communication needs of those with dementia. Have a look yourself at one of the items that will be performed by the BSO and BUDI Orchestra at the Winton life centre on Saturday 14 June, 11am, as part of the BU Festival of Learning programme. 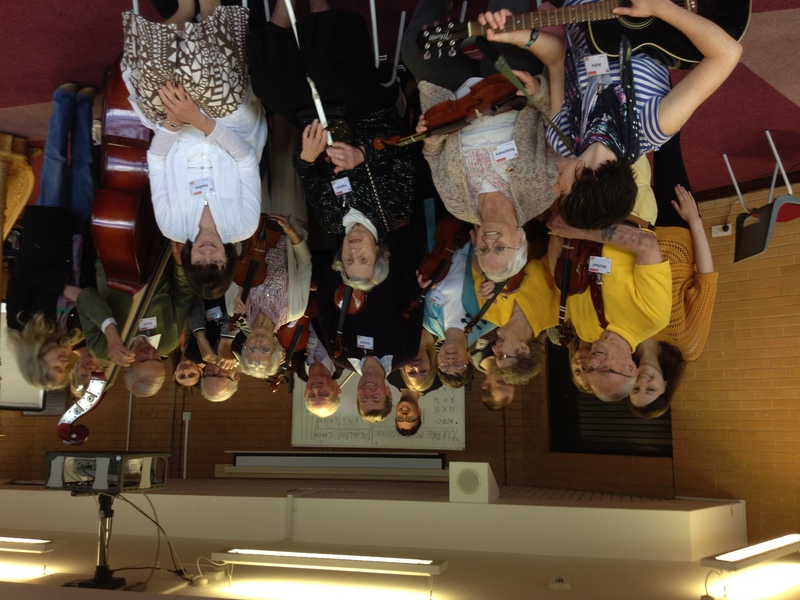 I’ve already shown this to whomever I met yesterday afternoon, and the surprise on colleagues’ faces when they understood that this was a group of people with dementia who had only been rehearsing for 9 weeks and the majority of whom had never played an instrument before was fun to see! Moving from playing, to singing to body percussion in one piece is challenging and demonstrates the development in learning the musicians have enabled over the sessions. To me, this project is a way to challenge the misconceptions and myths people hold about people with dementia not being able to learn and participate to a high level. I wish I could bottle the benefits that I observed in our participants, and, actually, the benefits that I have gained from being a small part of a truly special group that has created an amazing sense of community with acceptance, fun and friendship at its core. The group are already feeling the loss of these sessions as they know they only have one more rehearsal and then the performance and then our FIF funding stops. Yet this is what I would say is true impact: yes, we have the papers and other academic impact values, and we will seek to publish after the sessions end and the follow up period data is collected, but to see the development in how the professional musicians work with those with dementia, most who in the main had not worked with people with dementia before and their absolute engagement and commitment to creating a positive experience for the group; to see how our students have grown in confidence, and the relationships they have built with individuals with dementia is fantastic and demonstrates the impact of learning together. But most of all, to hear about, and see first-hand, the pleasure and benefits for those living with dementia and their carers makes this the best project I’ve ever had the pleasure of being part of, and if anyone has ideas about finding ways to fund this project beyond its research parameters as an on-going community engagement project, please do let me know!